The beauty of Long Key State Park camp site is that every site faces the Ocean. Now how many other places can guarantee you a view of the sea or ocean? Certainly not for the reasonable pricing that Long Key State Park charges. So it really is one of the camping sites in the Florida Keys that you should stay at, at least once whilst you are travelling around the Keys. Actually even if you are fortunate to live in the Keys, then you should definitely go up in the attic and dust down your sleeping bag. Wash out the old water bottle. And make your way to the Middle Keys and Long Key State Park. So let’s start with where the site is, and then we will fill you in with costs, amenities, local attractions, and anything else we consider useful for you to know. How Do I Get To Long Key State Park Then? The Campsite as we mentioned earlier is in the Middle Keys of Florida. 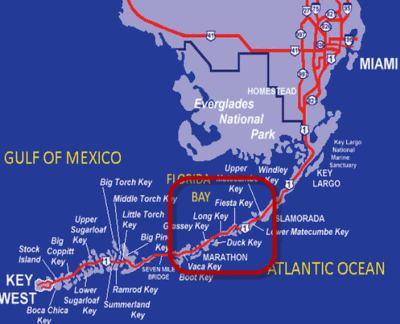 So if you look at the map below the Middle Keys is funnily enough in the middle of everything, and Long Key is once again in the middle of Islamorada and the Heart of the Florida Keys Marathon. To give you an idea how close the campsite is to some of the main airports we have provided the following times. Although we know that most people will be driving from wherever they live, this gives you an idea of how long to allow yourself. These are of course approximate, as you will be travelling predominately on the Overseas Highway, which is renowned for slow traffic at the best of times. Ok Now I Am At Long Key State Park, What Is There To Do? Well first of all make sure that you find the right site that you have reserved before you set out to explore the local area. They are quite strict on the reservation policy, as you can imagine, based where it is it is very popular with tourists the world over. 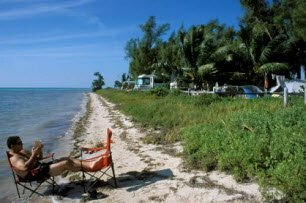 As we said this is really the closest camping site in the Florida Keys to the Ocean, as the paved road that leads into the campground zips between the Ocean on one side and the Overseas Highway or US1 on the other so you should end up with the perfect campsite location anyway. But it's still best to make sure that you haven't pitched your tent and then have to take it down and move it. That would be truly annoying. The park has three nature trails, and one of them is a water based one, which means for a small hire charge, you can get yourself into a canoe and paddle through the parks lagoon. It takes about an hour or so, and with the self-guide brochure is a nice peaceful activity to undertake. Talking about peaceful, then you can also participate in one of the Florida Keys most popular activities Saltwater Fishing. Long Key State Park is a great location for this, but please make sure that you check out our page on fishing licenses to make sure you don't get hooked by the police, for fishing illegally. The waters around the park are quite shallow, although the bottom are covered with seagrass, although that should cause an problems for anyone. The area isn't known really for rough conditions, so you will find the swimming to be generally in gentle conditions with smallish waves. Now you have canoed your way around the park, then why not take a stroll around the other two land based trails. Start with the "Layton Trail", that only takes about 15 minutes, and when you are feeling more energetic then explore the "Golden Orb Trail"
On a Thursday at 10:00am the Long Key State Park wardens, will take you around the "Orb Trail" pointing out flora, wildlife, and birds for two hours plus. The whole park is covered with a huge variety of shrubs and trees. Poisonwood, mahogany, Jamaica dogwood and crabwood are just a few of the varieties that you will see as you follow the warden around. So not only will you get your experience but you will have the company of a resident expert of the park. What About Showers, Toilets And Cooking Facilities? The park does have showers, and hot ones too. Which make a pleasant change from some of the campsites that I have stayed at over the years. So that keeps you clean and looking your best. Whilst all the 60 campsites, have a ground grill, picnic table, water and electricity. So whether you are visiting in a RV, with a good standard of home comforts or simply pitching a canvas tent, there is no reason that you cant stay nice and clean, with lovely full stomachs. A picnic under the Florida Keys stars...what more could you ask for? How Much Does It Cost Per Night To Stay At Long Key State Park? Rates are based on four people, with only one vehicle per site, and all the charges quoted include taxes. As of the time of writing the fees for an overnight stay at the park are as shown below, but please double check on the link at the bottom of the page to ensure that prices are current. Reservations can be made up to 11 months ahead of visiting Long Key State Park. If you are planning to visit with your own RV vehicle or camper van, then only one vehicle and one small tent are allowed per site. With maximum RV length being no more than 45 ft.